Over the years, FP's gained considerable notoriety for unique pieces like the "360" coffee table: a rotating, circular sheet of glass resting on three upturned sets of skateboard wheels, perfect for passing hors d'oeuvres, television remotes, and Whippits. 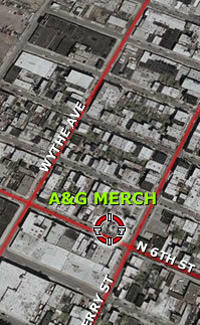 We recommend grabbing a necessity or two at A&G, then stopping by FP for something semi-useless but cool. By the time you host your next dinner party, your apartment will look so spanking no one'll notice you bought mismatched silverware off a blanket at the Bedford Street subway stop.